The Minister for Finance will travel to Frankfurt today, amid reports the ECB may let Spain impose losses on senior bondholders. FINANCE MINISTER MICHAEL Noonan is to meet European Central Bank president Mario Draghi in Germany today, amid reports the bank may be willing to allow the burning of bondholders. Noonan will travel to Frankfurt for talks with the ECB head as pressure builds at home to achieve a deal on the roughly €30billion in Anglo promissory notes. Davy Stockbrokers analyst Conall Mac Coille has said that the apparent change in ECB policy would “strengthen the Irish government’s hand in the negotiations to secure additional EU support to help Ireland’s debt sustainability”. Michael Noonan’s talks with Draghi will focus on “the long-term sustainability of the Irish financial system”, a spokesperson told Bloomberg. Ireland currently repays €3.1billion annually on the Anglo promissory notes. The payments to bondholders have generated considerable controversy in the past. Yesterday, the Wall Street Journal reported that Draghi has altered his position, and now supports imposing losses on senior Spanish bondholders as part of restructuring in the country. “The apparent change in ECB policy is in stark contrast to the pressure exerted on Ireland to ensure that senior bondholders in failing Irish banks were paid in full,” Mac Coille said. Email “Noonan meets ECB head Draghi: Will he allow us burn the bondholders?”. 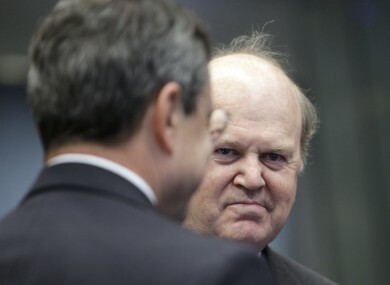 Feedback on “Noonan meets ECB head Draghi: Will he allow us burn the bondholders?”.